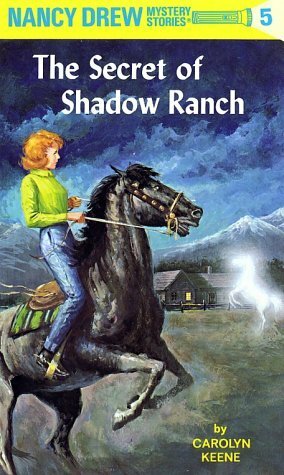 The fifth series book has Nancy and her cousins solving the mystery of a ghost horse that continues to visit the ranch of their aunt. Along the way, Nancy finds herself again solving three mysteries as her friend Alice’s long lost father has been missing for some time. A painting at a local shop leads Alice to believe he is still alive and somewhere in the area. But it wouldn’t be a true mystery without the third adventure of a missing treasure and the map and clues are hidden within the ranch somewhere. Along the way, Nancy finds herself befriending a man who started out hateful and soon grew on her. It was nice reading about Nancy having a possible boyfriend, considering so many of her friends are getting married or dating.